With the water temperatures exceeding 23 degrees C out wide, a few gamefish are starting to appear. While the local marlin masters like to keep their little patch of heaven between the Hen and Chicks and the Mokohinaus quiet, once the bait turns up so do the marlin. Tactics here are simple. You can probably troll your lures around and around the work-ups until you go dizzy with little or no result. Sneak up on the fringes with a decent set of bait flies or small jig and grab yourself a couple of livebaits. Rig them up and throw them back into the action. Chances are it will soon be snaffled by the target species. No livebait tank or tuna tubes required and you only need one game set, not a full spread of them. The popular area this time of year is the triangle corners by the Chicks, Mokohinaus and the Niagara wreck mark. Laster on the action will most likely be off Ocean Beach. Be like the fish, follow the bait. Inshore the fishing is still producing good catches out over the sand. One of our contributors Ben Francis, fishing out of Mangawhai earlier this week, headed down off the Waipu rivermouth and got among some decent kingfish livebaiting. 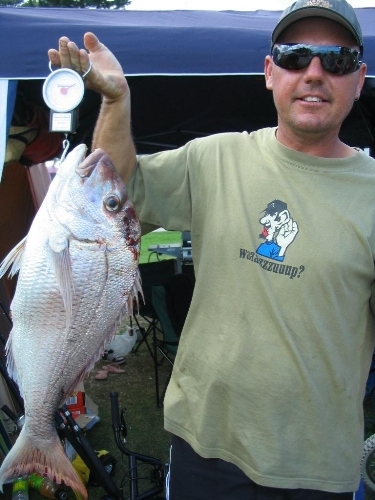 To top it off he soft-baited some nice snapper, bringing half-a-dozen home for sinner while releasing plenty of others. The depth in this area is around 14-15 metres so with care you can release fish. Last Friday we headed out to the 'Fingers' off Bream tail for a late afternoon fish in 30 metres. The bite was slow to start with, so we moved in a little closer to 22 metres where there was plenty of scattered sign on the bottom. As the sun dipped over the horizon there was a short, sharp bite, seeing us finished with some nice pannie snapper and trevally in the bin. The go-to lure colour was Coconut Ice which out-fished all others. On Saturday we headed to a lump of foul ground just inside the Hen and while the fish were not so numerous, they were much bigger with the best just a tad over 5kgs. Had a little bit of fun with the kingfish out there as well. There have been some good gurnard turning up in the mix over the sand. The previous week Miah Dixon landed a 46cm specimen, one of the biggest I have seen caught in the bay. It took one of the new Hayabusa tungsten head sliders. At 1.76 times the weight of tradition lead, these lures have smaller heads and can be fished deeper. Gurnard are quite aggressive feeders and are attracted to the slider type lures.